To figure out how many drugstores still sell the quack homeopathic remedy Oscillococcinum, we called 150 pharmacies on the island of Montreal. The results could be worse, but they still aren’t pretty. Since Boiron’s website directs infants, children, and adults to use the product “at the onset of flu symptoms”—defining the manifestations of the flu as “fever, cough, headache, malaise, and respiratory tract inflammation”—we can infer that a misinformed parent could read this notice and decide to give the product to their feverish child. They would be further misled by the fact that the product is sold in pharmacies alongside actual medical drugs. But how many pharmacies do actually carry this “remedy”, a product which does not work, cannot work according to our scientific knowledge, but which comes recommended by its maker for infants with a fever? We set out to answer this question for the island of Montreal by calling a lot of pharmacies. And I mean, a lot of them. We focused exclusively on the five biggest pharmacy chains in Quebec: Jean-Coutu, Familiprix, Uniprix, Proxim, and Pharmaprix. For each chain, a sample of 30 pharmacies was chosen by a random number generator. And the calls started, all in French, with the following script: “I would like to know if you carry a certain homeopathic remedy. It’s called Oscillococcinum, it’s a homeopathic remedy against the flu made by Boiron.” If they did not have it, I asked if this was something they normally carried. I spoke to either a floor clerk or a member of the pharmacy staff behind the counter, depending on who knew the answer. That was it. And I kept a tally. Hold the line, we’ll transfer you to our naturopath! In the process of making 150 phone calls, I made a few stray observations. 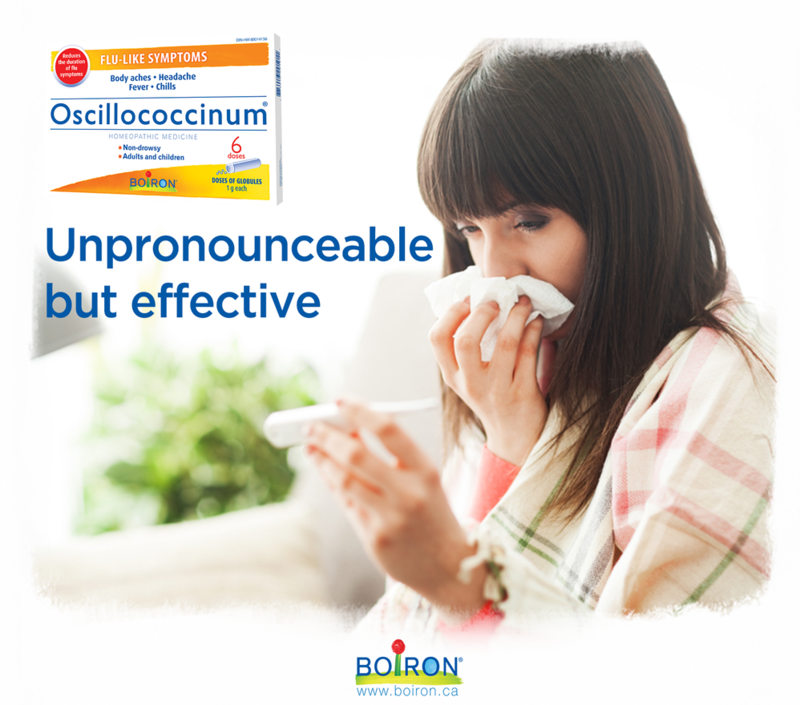 First of all, the name “Oscillococcinum” was foreign to most of the people I spoke to, and I was asked to spell it out many, many times. It’s safe to infer that pharmacy staff often were not aware of the existence of this product. The complexity of its name and the chances of misspelling it in an inventory system, for example, should also be taken into consideration when looking at our data. It’s possible that more pharmacies stock the product, but that the person I was speaking to on the phone simply wrote it down incorrectly and could not find it. Many pharmacies told me they did not carry Oscillococcinum (or any homeopathic product) on account of the store’s small size, with some employees even apologizing to me. Staff at two pharmacies that did not sell the product advised me to check out a natural health store near their location. Only one person (working at a Familiprix) told me they did not have the product because they did not trust these types of medicines. The fact that two-thirds of Montreal-based pharmacies will sell us a pseudo-treatment for the flu that targets adults, children and infants alike is hard to square with the Quebec Order of Pharmacists’ mission statement. They describe said mission as “ensuring the protection of the public”, but how is the public protected when pharmacies are selling them placebo pills? The harm is partly financial: 30 doses of these worthless globules retail for CAD 36. It is also in the false sense of security parents will gain and the delay in proper treatment if needed. And, ultimately, it is in the legitimization of a pseudoscience the founding principle of which is that the more you add water to something (like alcohol), the more powerful it becomes. When I was growing up, drugstores in Quebec used to sell cigarettes. The Quebec Order of Pharmacists started discussing the idea of stopping this around 1984, but it wasn’t until 1998 that the Quebec government enacted a law to ban the sale of cigarettes in pharmacies, giving these stores two years to do so. The reasoning is quite obvious, especially in 2019: pharmacists should not be selling products that harm their clients. Despite this simple line of reasoning, there is money to be made in drugstores selling unhealthy food, like chips and soft drinks, as well as ineffective pseudo-treatments, like homeopathic cough syrups for kids and duck offals diluted out of existence. So the next time you visit your pharmacy, check to see if they sell Oscillococcinum and ask your pharmacist, “Why?” If drugstores managed to survive the ban on cigarette sales, I’m pretty sure they’ll survive not selling quackery. Let’s see which chain makes the first move. If it’s made from a duck and quacks like a duck, it’s got to go. There’s another layer to this story that may be of interest to you, especially if you’re a journalist or particularly interested in the spread of pseudoscience. The island of Montreal is not homogenous in terms of languages predominantly spoken and ethnicities. For example, native English speakers are much more concentrated in the Western part of the island, whereas the opposite is true of native French speakers. We wanted to make sure the pharmacies chosen for this exercise were representative of the entire island. We also wanted to see if there was a difference in Oscillococcinum availability by geographic location. We divided the island into three parts: anything west of Highway 15 (or 117 north of the Metropolitan, to keep a straight line) was “West”; anything east of Papineau was “East”; and “Centre” was in the middle. 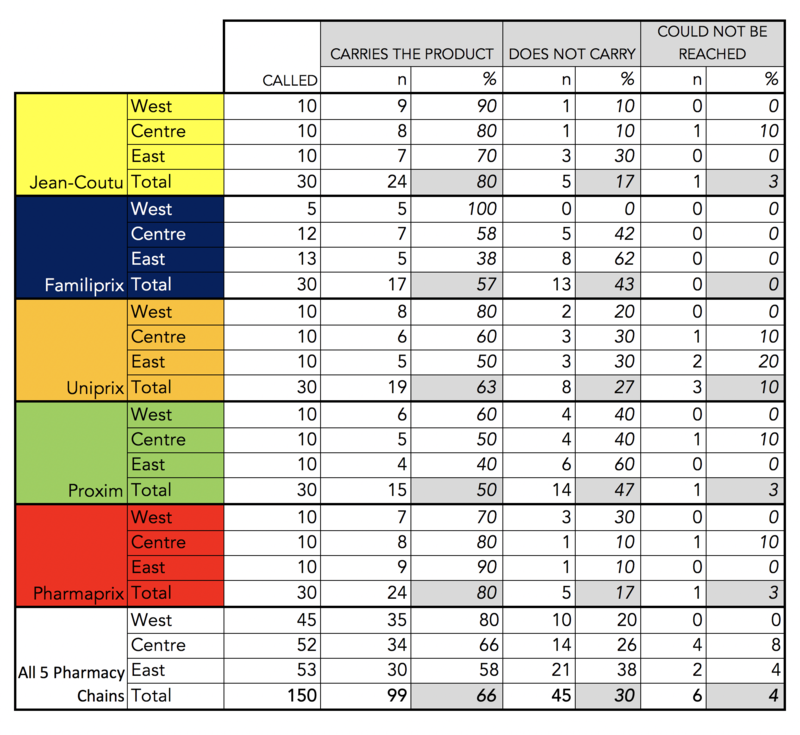 When sampling the 30 pharmacies to call per chain, we actually randomly sampled 10 stores in the West, 10 stores in the Centre, and 10 stores in the West. The only chain for which there weren’t 10 stores in the West was Familiprix, so additional stores in the Centre and East were selected to compensate. We checked to see if stores in one part of the island had a much different availability of the product, but that comparison came out negative (Pearson’s chi-squared test value of 7.9442, with a p value of 0.094). When comparing only the Western pharmacies to the Eastern ones, there seemed to be a difference (with Western pharmacies seemingly more likely to carry the product), but the sample size was too small to know for sure.